We are delighted to announce our Story Massage online course. We are collaborating with Lorraine Murray from Connected Kids to bring you this easy-to-use, interactive and dynamic online training. Benefits of our Story Massage online training option for YOU! Do you live abroad? Are you juggling work and children? Do you find it hard to travel to one of our face-to-face courses? The online Story Massage course now offers you the flexibility to study from home at a time and a pace to suit you. The course (approx. 12 to 18 hours of study) includes everything covered in the face-to-face Story Massage course. We understand that it can be quite lonely studying online and so we have made the course interactive and practical with video and audio clips, self-assessements and downloadable work sheets. You will feel that you are in the training room with us! And we also offer follow-up support with a facebook Story Massage community group, regular blog, newsletter, YouTube channel and virtual classroom. 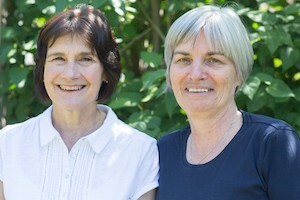 Your course tutors are Mary Atkinson and Sandra Hooper, co-founders of Story Massage. That’s us, pictured below. 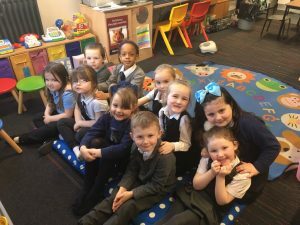 We have collaborated since 2007 to develop inclusive activities for sharing the benefits of positive touch with children of all ages and abilities. Mary Atkinson (left) is a complementary therapist and tutor with many years experience in writing stories and award-winning books and training programmes. 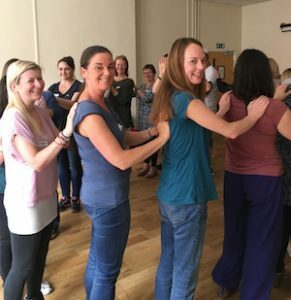 Sandra Hooper (right) is a complementary therapist with a background in primary education and as an international trainer on the Massage in Schools Programme. “What can I say apart from WOW! 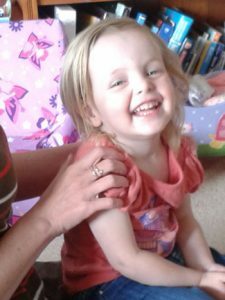 I have been working with children for many years and understood the benefits of positive touch, so I completed the online course just for fun. However, learning about Story Massage has totally changed how I work, the children absolutely love it and are so excited to take part. The online course was easy to follow, fantastic clear videos and gaining certification was a clear process. Highly recommended.” Cheryl Kennedy, Autism and Wellbeing Consultant for AIW Consultancy. “I felt engaged…. more so that I thought would be possible via an online course where positive, nurturing touch is at the centre! I am impressed by the authors’ attention to detail and recognition of different learning styles. It is a well-balanced and varied course with excellent pacing of sessions to build up confidence. Most of all, I appreciated the gentle guidance with tips, suggestions and lots of inspiring and useful links to resources.” Helene Goulet, Elementary School Teacher and MISP Instructor, Canada. You can find out what others are saying about the course by following this link: Fantastic Reviews for Story Massage course. There are simple interactive self-assessments throughout the course (see below). At the end of Module 5 you will also be asked to complete three questions about the course and submit this plus an example of a massage story that you have adapted or created. The course is approved by The Federation of Holistic Therapists (FHT) for CPD points. We will issue you with a certificate of completion which can count towards your CPD (Continuous Professional Development). You may wish to confirm with your insurer/employer that they will accept this course. For those wishing to work as independent practitioners with groups of children or adults, we offer the option of gaining a Story Massage Instructor qualification. Please email us on info@storymassage.co.uk for more information.